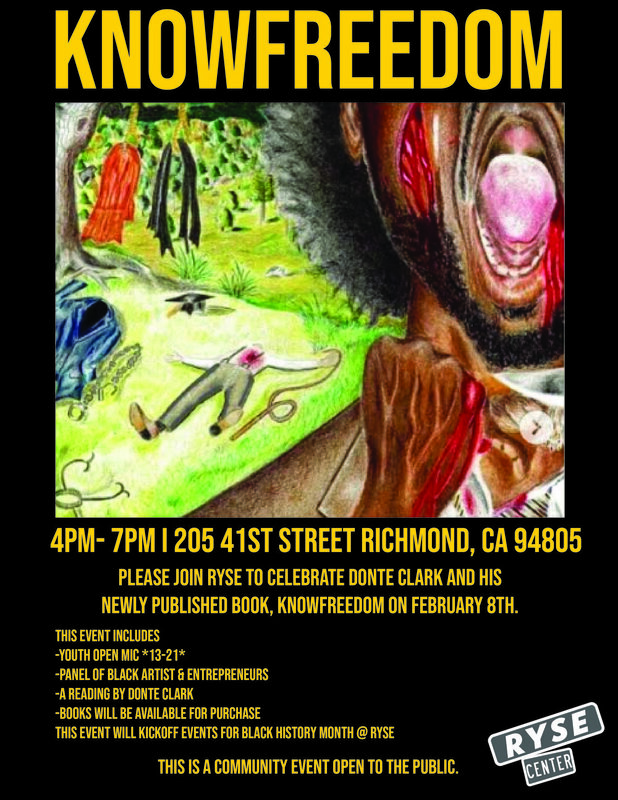 Join RYSE in celebrating Donté Clark’s new collection of poems, KNOWFREEDOM! Panel Discussion and Q&A with Black Artists and Entrepreneurs from the Bay Area, Janae Johnson, Tongo Eisen-Martin, Elisha Greenwell, and Leeah Thomas. Read their bios below! This event is FREE and open to all ages with RSVP. Get your ticket below! Donté Clark is a working artist/educator from Richmond, CA. He aids young people in writing and artistic development as a vehicle to create change within themselves and their communities. He facilitates writing workshops, lesson planning, script writing and songwriting, studio recording, performing and acting, directing, fundraising and outreaching to young people. In 2015, Romeo is Bleeding was released, an award-winning documentary that follows Donté's work in Richmond. JANAE JOHNSON is a Senior Program Manager at Youth Speaks. She is a poet, community organizer, curator and teaching artist. Janae is the 2015 Women of the World Poetry Champion as well as a 2015 National Poetry Slam Champion. She is also the Co-Founder & Co-Director of both: The Root Slam poetry venue in Oakland, California, and The House Slam poetry venue in Boston, MA. Janae is also an Executive Council Member of Poetry Slam, Incorporated. Her poetry has appeared in outlets such as ESPN, PBS Newshour, and Kinfolks: A Journal of Black Expression. Janae currently resides in Berkeley, CA & enjoys discussing Stevie Wonder, and black musicals. LEEAH THOMAS is a 17 year old Black artist out of Richmond, CA. She recently slammed in her first Teen Poetry Slam last year, and performed for "Bringing The Noise for Dr. Martin Luther King Jr." She has also performed at UC Berkeley for the Women of Color Conference. Her work focuses on the beauty and trials of being a young Black artist, as well as exploring the realities of multifaceted relationships and identity exploration. She is currently working on a collection of poems entitled You Thought You Knew Me. Originally from San Francisco, TONGO EISEN-MARTIN is a poet, movement worker and educator. His book titled, Someone's Dead Already was nominated for a California Book Award. His latest book Heaven Is All Goodbyes was published by the City Lights Pocket Poets series, was shortlisted for the Griffin Poetry Prize and won a California Book Award and an American Book Award. ELISHA GREENWELL is a northern California native and 12-year advertising vet. She is a graduate of UC Santa Barbara with a B.A. in Business Economics and Creative Writing, and the Academy of Art University with an M.F.A in Advertising Strategy. Throughout her career she has developed award-winning brand strategy for companies such as Intel, Nike, Target, Starbucks and Facebook. She is also the founder of Black Joy Parade, a celebration of the Black experience and our influence on cultures past, present and future. The 2nd annual event takes place on February 24, 2019 in Oakland, CA.